To follow up on the roll cage discussion . . . I received a very logical PM from another racer concerning my decision not to run a cage. . . Based on that input I have decided that. . YES I WILL NOW BE INSTALLING A ROLL BAR. What it comes down to is that it seems a bit stupid to be running a racecar and leaving a roll bar in the garage. 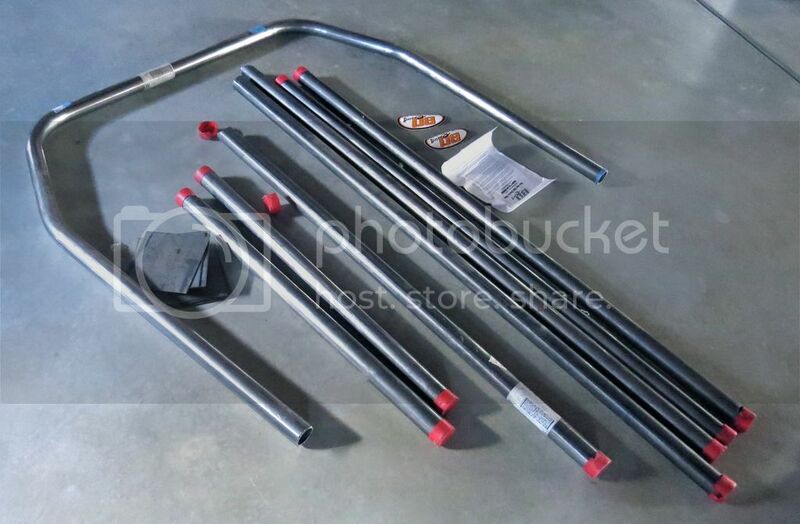 A few years ago I bought a BD Racing 8-point roll bar kit. They did not have a kit for a Geo Metro. This is a pre-bent and notched kit that is designed to fit a Chevrolet Chevette. Before I ordered it I found a Chevette and took a few measurements. It appeared to be a close enough fit for the Metro. I have test fitted the main hoop and all that was required was to trim a small amount off the base of the main hoop. The tubing is 1 5/8 “ diameter .134 wall Mild Steel. An additional kit is available to add the bars for a full cage. 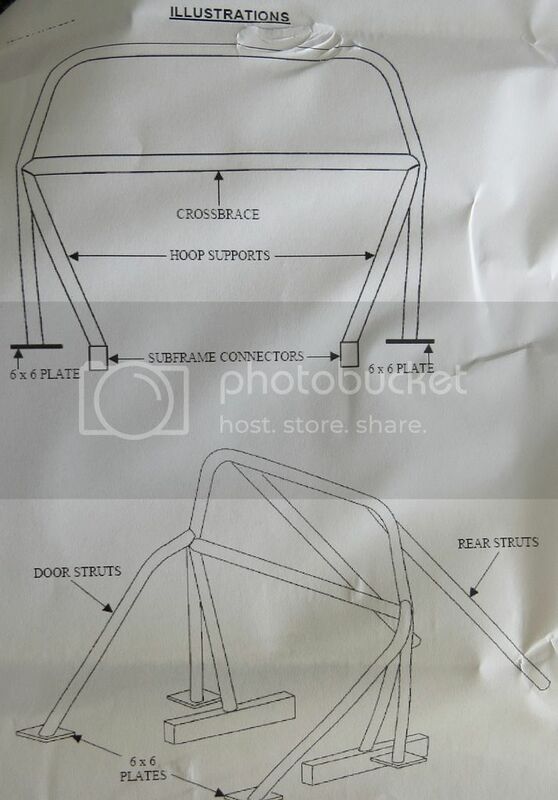 There is also a kit to install a funny car style driver cage. Just now I tried to go to BDRacing web site (BrokeDickRacing) but it goes directly to www.rhodesracecars.com for Rhodes Race Cars. Rhodes seems to have everything I would need (extra mounting plates, gussets, etc.). Now I need to find someone to do all the fitting and welding. If I still lived in Pennsylvania I would take the car to Delaware Chassis Works and have Joe do it. Just got back from four weeks in Spain. The plan was that when I returned from this trip to finish up remaining items to get the car ready for September ECTA event. But there is a little set back. The Spain trip included two weeks of bicycle touring. The second week (Friday the 13th) I crashed hard and separated my left shoulder. Was still a nice vacation (food, friends, sightseeing, etc) but for the short term I have limited use of the left arm. It will heal but not sure how soon I can be turning wrenches. Shoulder specialist in Boulder, Colorado will evaluate the injury next Tuesday. Still hopeful that I can be ready for September. Hopefully, we'll find out at the June meet if the September meet will happen or if we're done there. Gregg, Yes I am aware of that. Hopefully ECTA will still run a Sept event in Wilmington. If not I'll re-evaluate the best move for racing this little car. The Colorado mile is held about two hours from home. El Mirage is about 300 miles closer to home than Wilmington. But running with SCTA will require adding the full cage, fire system and a few other items. I'll just wait and see . . .
Hello there. I haven't made much progress this year. And I am currently recovering from prostrate surgery. The good news is that all is well and I am healing quickly and completely. HOWEVER - I see that all my photos in this diary have gone down the photo bucket drain! Although most forums are likely be configured to display attached images as part of the post, it's not possible to preview attachments so you should always browse to and attach your files just before you finally post your message." So . . . I have attached a file called test image and now I will hit Post and see what happens. Hopefully the image will appear . . . .
Looks like it worked perfectly LL. So I go to post something and the system provides the following gentle reminder . . .
120 days . . . . hmmm . . . . More like 10 months!! Anyway, I've been worse than lazy and haven't done jack on the car. I tell people I am in the 15th year of a two year project . . . Since the ECTA found a new place to run I am getting back into the mood to continue on the car. So I came back to the build thread and what do you know. Nearly all the photos are showing. I had posted all but one of the photos using Photobucket. Then Photobucket changed their 3rd party hosting rules and wanted something like 400 bucks a year to continue. I sent them a less than polite email basically accusing them of extorting us to pay or lose our posted photos. I never did pay anything. So I really have no idea how the photos re-appeared . . . must be a result of all my good living . . . .
ECTA is running again after a year off in 2017. With the new year came a few minor rule changes for ECTA including the requirement to have dual circuit brakes or some sort of backup braking if a single circuit failed. I had originally discarded the front brakes on the Geo and installed a single circuit master cylinder. I emailed ECTA for a exception. Got a nice email back that said they felt it would be better if I upgraded my brakes. They suggested I install front brakes with a separate m/c for the fronts. Went to the internet to find parts. . . . . All items have arrived including rotors, calipers, pads, hoses. Just need to get hard lines to connect the m/c to the hoses. I will be using a hand operated master cylinder that is usually installed in drift cars. It will be a backup system if the rear brakes need some help. Hopefully I can get the brake parts installed before I leave for vacation in a few weeks. I'll post some photos in a few days. All the car needs is to hook up the wiring, secure the exhaust and finish the brakes. How hard can it be?